MySQL Performance : 1M *IO-bound* QPS with 8.0 GA on Intel Optane SSD ! Historically, Random I/O Reads were always a major PITA for any OLTP workload.. If Random I/O Writes you could yet "delay" via controller's caches (or any kind of other battery-protected caches -- specially if Writes are coming in bursts), there is no way to "predict" I/O Reads if they are fully Random (so you cannot "cache" or "prefetch" them ahead and have to deliver the data directly from storage, read by read.. -- which is hitting a huge "rotation penalty" on HDD). Indeed, things changed dramatically since arriving of Flash Storage. You don't need to spend any particular attention if your I/O Reads are Random or Sequential. However, you still need to keep in mind to not hit the overall throughout limit of your Flash Device. As the result, reading by smaller I/O blocks allowing you to do more I/O operations/sec than with bigger blocks. However, if your rows are well grouped within 16KB page -- you may still win on doing less I/O Reads, but not get any overall QPS performance gain comparing to "non compressed" default case).. NOTE : while there is still a possibility that some data will be re-used from BP, this test scenario is generally saturating any flash device much faster then you can imagine.. -- so, the whole processing here is really IO-bound and IO-driven. So, on a pure I/O test on this drive a single thread is already delivering 65K Random Reads/sec of 16KB ! -- but also reaching 1000 MB/sec throughput, means with 2 or 3 threads we're already reaching the max IO rate on this device. However, there is a big difference between "pure IO" test and database "IO-bound workload" -- there is still a lot of processing around every SQL request (not only I/O)..
yes, MySQL 8.0 is showing a real difference here by reaching over 1M IO-bound QPS !!! NOTE : the max QPS on MySQL 5.6 and 5.7 is reached with 8KB page size here (become worse on 4KB page due present in these versions fil_system lock contention).. The results are obtained on the same Skylake server with the same config settings as described before. The only difference is that 50M rows were loaded per table and BP size was reduced to 32GB. In the previous article I've intentionally skipped the topic related to Binlog impact on MySQL 8.0 Performance because it's not a short story, nor a simple one.. So far, I'll reuse the same Skylake server as before, but will reduce it to 1S (1CPU Socket, 24cores-HT) -- so, you don't believe it's all because I'm using a "big HW" (while 2S HW is the most common server config today in all data centers where people are running MySQL, and having 16-24cores per CPU Socket is what is todays "commodity HW") -- but well, let's stay with 24cores-HT for the following experiment ;-)) And as the storage it'll be the same Optane drive with EXT4 filesystem. as you can see, on a higher load enabling Binlog is helping a higher TPS ! as you can see, enabling Binlog is helping a lot MySQL 5.7 to not loose performance on high load..
and 20K TPS instead of 25K TPS is a pretty huge difference..
but since the Writes are more aggressive in your workload, the impact then is even more dramatic..
more that x2 times TPS drop.. 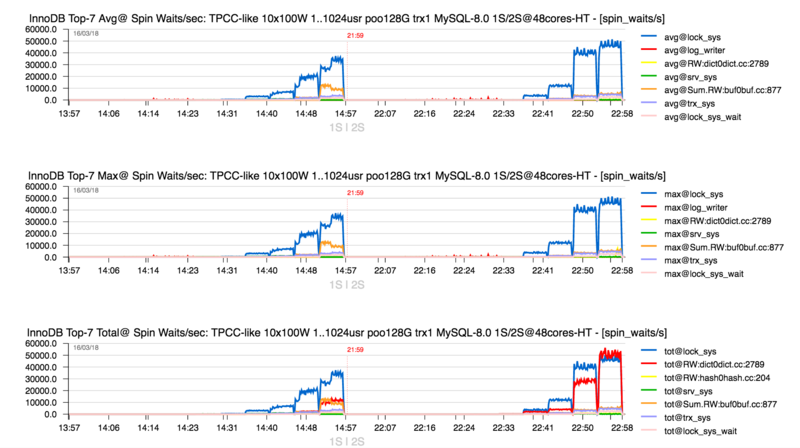 This is the reason why Binlog stuff in MySQL 8.0 must be fixed asap, and I really hope it'll happen soon ! -- seems like the whole story around Binlog must be re-visited and re-implemented..
And I'm following mostly the same test conditions as previously explained for MySQL 5.7 GA -- similar variations in options (spin delay = 6;24;96 / thread concurrency = 0;64;128 / taskset = 1S/2S, etc.) to let each Engine to show its best possible TPS/QPS results. trx_commit = 1 : along with our work on InnoDB REDO re-design we not only fixed the biggest related bottleneck, but also discovered and partially fixed several other issues around REDO (also mostly historical, but still) -- keeping all this in mind, I'd rather suggest you today to use "1" (flushing REDO log on COMMIT) whenever possible -- specially that with all the progress we're seeing on HW/Storage improvement last years -- the penalty of "1" with 8.0 becomes much less dramatic than before -vs- "2" (flush REDO log once per second), and also a big enough total size for the whole REDO space (currently I'm using x16 or x32 log files of 1GB each), more about later..
PFS = off : I'm intentionally now switching Performance Schema OFF just because it's not a bottleneck, but a pure "overhead" (as many other things as well) -- my main target in all benchmark investigations is "to see what is our next bottleneck", and as HW resources are always limited, any additional overhead will help to "hide" the real problem.. While PFS overhead is part of MySQL QA testing, and every overhead higher than 5% for "default instrumentation" is considered as a bug (mind to file a bug if you see it bigger in your case!) -- while from the other side many users are asking to see more an more instrumentation enabled by default regardless overhead (and this "balance" between overhead and benefit from built-in instrumentation is generally can be observed only case by case). Checksums = off : this is also a pure "overhead" and not a bottleneck, while since CRC32 is supported, generally you'll not hit any problem..
Charset = latin1 : while most of interest is moving to UTF8, I'm continuing to test with "latin1" for the same reasons as UTF8 -vs- latin1 "overhead" which may hide you more important problems (while using UTF8 in 8.0 is giving you a direct gain -vs- any previous MySQL release, but I'm rather looking to point on problems than hide them)..
DoubleWrite = off : this, however, is a big problem and a big bottleneck, but the fix was already developed by Sunny since 2 years now, we worked on this together, and I can confirm you you'll not see any TPS drop as soon as your storage is able to follow (as you "writing twice", e.g. x2 times more) -- but the code is still NOT part of 8.0 because "there is always something more important to do" ;-)) -- please feel free to urge Sunny to push re-designed DoubleWrite code to 8.0 asap !! (Sunny's twitter : @sunbains) -- while for my part I need to see "what is after" once the new code is delivered..
Binlog = off : this is another big problem, and on the same time both bottleneck and overhead.. -- but this one rather need a very particular attention, so I'll skip it here to say you more later..
over 45K TPS with MySQL 8.0 ! NOTE : and we're still far from the max possible TPS to get from this HW ! => work in progress..
near 250K TPS with MySQL 8.0 ! even the results with MySQL 8.0 are looking better, we're yet far from scaling on Writes ! work is still in progress..
And if you wish to reproduce the same tests, you can find the MySQL 8.0 starter note here, and test related instructions from here and then here.